How Old Is Your Map ? Geography and cartography make for fascinating studies. Collecting maps of various kinds goes hand in hand with studying history. The patterns of human migration, travel and exploration are recorded in maps and globes. Maps and globes express much information regarding current events, changes in landmarks, capital cities. If you are a connoisseur of older globes you will certainly identify with this. It is quite interesting to observe the descriptions of geo-political boundaries and see how the names of countries and various landmarks have changed over the years. When you look at a map or globe you can imagine the experiences and perspective of those living in an era gone by. Collecting maps and globes is a fascinating hobby and an excellent way to study history. It can be very interesting to watch the changes in There’s a good chance that you might have an old map or globe laying around your home or office. You can tell a lot about a map’s age just by looking at the names of the countries. Just in the past 25 years several countries have changed their names. The former Soviet Union has disintegrated into fifteen separate countries Armenia, Azerbaijan, Belarus, Estonia, Georgia, Kazakhstan, Kyrgyzstan, Latvia, Lithuania, Moldova, Russia, Tajikistan, Turkmenistan, Ukraine, Uzbekistan. Yugoslavia has become Bosnia-Herzegovina, Croatia, Macedonia, Slovenia, and Yugoslavia. In the past year alone the Czech Republic has become Czechia. Who knows what changes the coming year of 2017 will bring to the wonderful, wide world of geography? Check out our website for maps and globes that reflect that most current information and descriptions. There are plenty of maps, globes and atlases to meet your needs whether you are a educator, parent, student or simply and informed citizen. Ultimate Globes will always be here to provide you with the largest selection of quality maps and globes that meet your educational and interior design needs. Check out this very cool graphic to figure out the age of your map or globe. Also check out our website for additional maps, map dating resources and all kinds of fascinating information. The intersection of technology and geography has created some innovative and interesting globes. The MOVA Globe is a spherical representation of Planet Earth that utilizes light in order to rotate. Both natural and artificial light are harnessed by the globe as it spins on its axis. No messy cords to get tangled and no expensive batteries to replace. The rotation of the globe is a simulation of the motion of our Planet Earth. An artistic piece like this will add creative appeal to any interior space. MOVA globes are hand crafted from the best materials. An assemblage of finely polished polymer, resin shells and non-toxic fluids allow the spheres to rotate smoothly. A highly sophisticated mechanism nestled inside each globe generates power from ambient light. A combination of solar cells, magnetic elements and other proprietary pieces generate the power necessary for this process. Behold a scientific and artistic wonder! This commanding and creative centerpiece will attract attention and conversation in any part of your home or office. The MOVA globe is comprised of two spheres, each nestled inside the other. The inner sphere provides the kinetic energy for rotation, it is encapsulated within a second sphere which is transparent and contains fluid. The globe is suspended in this environment which is nearly friction free. The globe and the liquid it is suspended in have almost equal density. The similarity in density means that as the inner globe rotates, the liquid redistributes itself evenly around the sphere preventing contact between the inner and outer spheres. The lack of friction generated by this situation allows the inner globe to rotate.The inner sphere is semi-permeable and allows some of the light spectrum to penetrate the pigment of the image. The inner sphere contains several photovoltaic cells which generate energy from this light. The inner sphere also contains a magnetic field which synchronizes itself to the magnetic field of Planet Earth. This system functions in a similar fashion to compass rotating its magnetized needle to align itself with earth magnetic field, indicating due north. The motion generated by the photovoltaic cells provide the momentum necessary to keep the sphere spinning in motion. The wonders of geography and technology have combined to create this fascinating masterpiece, a brilliant display of the laws of physics. These globes are available in a variety of styles and colors. The model featured above is the MOVA Earth View with Cloud Cover Revolving 6 inch globe. What a wonderful addition this would make to the mantle of a fireplace! The contrasting colors are classic yet vibrant. Instead of having to spin the globe to see all of the countries, simply sit back relax and plan a trip to your favorite holiday location as you watch it rotate. A variety of stands are available to maximize your viewing pleasure. Crystal and wooden stands are available to display this piece to best advantage. Globes make such elegant and sophisticated presents. As the holiday season approaches there are so many presents to buy and people to think of. Presents that are non-consumable and aesthetically pleasing are a great choice. A globe satisfies both of these criteria. 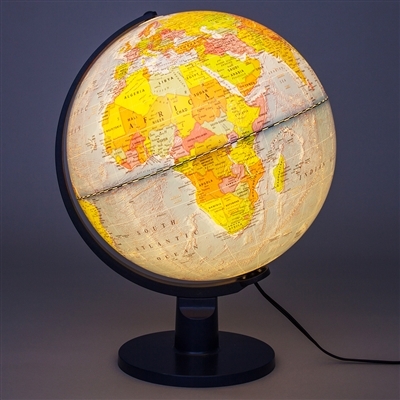 Desktop globes are compact and easy to transport, this is a classic item with reference and design value for years to come. One of our classic globes will easily find a new home on a coffee table, bookshelf, office or dining room. 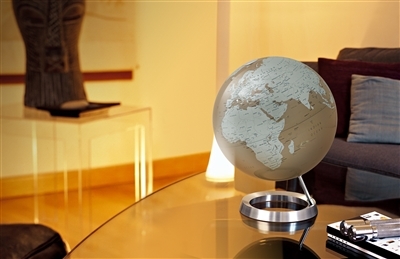 These are the top 5 styles of desktop globes for 2016. 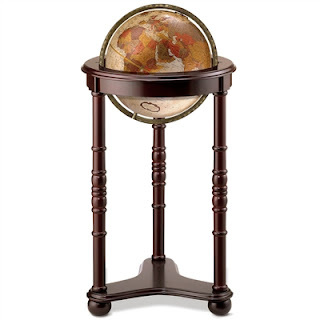 The Monarch is a 14-inch decorative tabletop globe from Replogle. This unique globe makes use of various shades of black, grey and silver to express the outline of Planet Earth in detailed relief. Descriptions of countries, continents and landmarks are clearly visible in red and black lettering. A full swing meridian makes navigation particularly convenient. The sphere rests on a deep veined marble base reflecting also the black, grey and silver themes of the former. 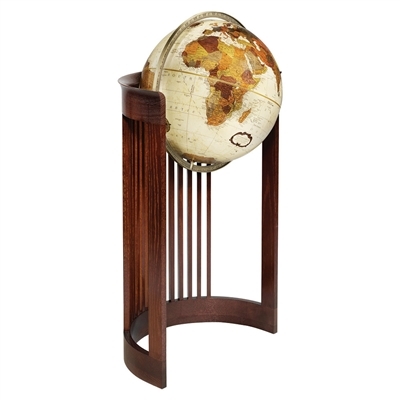 This artistic and elegant globe is especially suited to library and office settings. The compact size means that a desk or bookshelf can easily accommodate it. 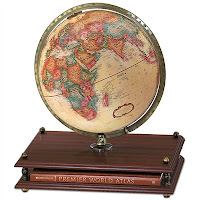 The old school charm of the Premier from Replogle Globes holds particular appeal for lovers of antiquity. Antique oceans, raised relief, and a brass plated full meridian are reminiscent of a bygone era. The rich and luxurious cherry wooden base is sure to a please a teacher, professor, or other professional. This three-dimensional representation of Planet Earth is sure to be an eye catching centerpiece for a coffee table or bookcase. The globe is an excellent reference tool containing the latest information regarding geopolitical boundaries in its own right. However, the wooden base also features a compartment for a hardcover copy of the Rand McNally Premier Word Atlas. A classic globe with antique styling enhances a professional setting Premier is 12-inches in diameter and the stand and sphere reach a height of 18 inches. The Freedom from Replogle Globes is a sensational choice for a holiday present. Lovers of nature and American heritage will share an interest in this one of a kind figure of the Earth. The 12-inch sphere rests a top a bronze colored relief of an eagle. The wings of the eagle are spread in flight invoking a commanding and powerful presence. The majestic and metallic eagle rests on a wooden base. The cherry finished wood is an excellent complement to the die cast full meridian. 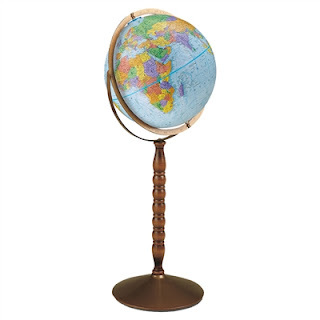 The reference value of this globe is equal to its aesthetic appeal. The antique styled maps has raised reliefs and detailed descriptions of geopolitical boundaries. The Freedom is another excellent choice for office décor. Any professional setting would be enhanced by the impressive nature of this centerpiece. 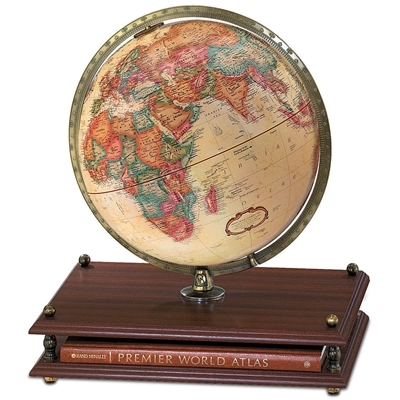 The Mariner is a very versatile globe, because it features both ocean topography and cartography. This globe provides a level of detailed information regarding the ocean floor that is not provided on most globes. It's name is quite suitable. The geopolitical boundaries are updated with each production cycle ensuring that the most current and accurate information is provided. This particular model is available in two styles one features an internal LED for illumination the other does not. A semi- meridian and a base made from dark cherry wood enhances the elegant appeal of this globe. 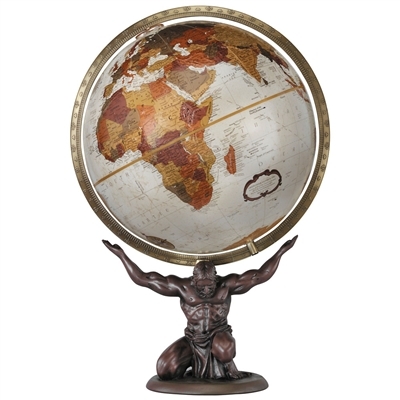 The mythical legend Atlas holds the world on his shoulders. 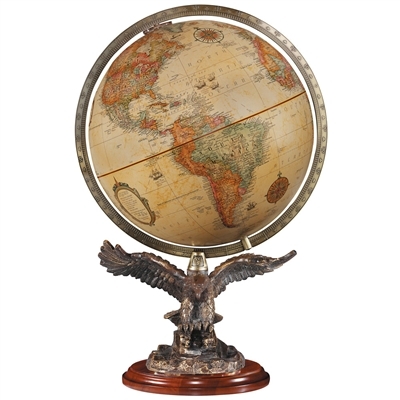 This globe is appropriately named after the figure of Greek Mythology "Atlas" as penance the Greek god was designated as the guardian of the Earth. This one of a kind world globe rests a top a relief carved stand featuring Atlas. The 12-inch sphere stands 20-inches tall when mounted on the stand. The map of this globe features modern day geographic descriptions yet retains old world charm and elegance. A full meridian and champagne colored oceans enhance the rustic ambiance of this sphere. Educational value and artistic appeal combined in one package. Get your holiday shopping finished early this year and take advantage of our deals. December is around the corner and it is never too early to start considering holiday presents. Hanukkah, Kwanzaa and Christmas will be here all too soon. As you begin considering Holiday presents take a look at our holiday buying guide for inspiration. Here are five floor standing globes that make excellent and memorable presents. The Lancaster is a great globe for a library, study or entryway. The 12-inch sphere rests on stand made of cherry wood, the combined height of the assembled globe is 35 inches. The Lancaster is available in two variations, one features blue oceans and the other features antique oceans. 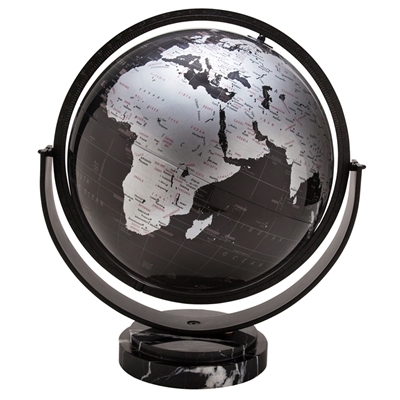 A globe like this one is ideal as an accent to a professional setting. The Lancaster may be rotated 360 degrees, for an unobstructed view of any section of the sphere. One of the practical benefits of a full swing meridian is easy navigation. 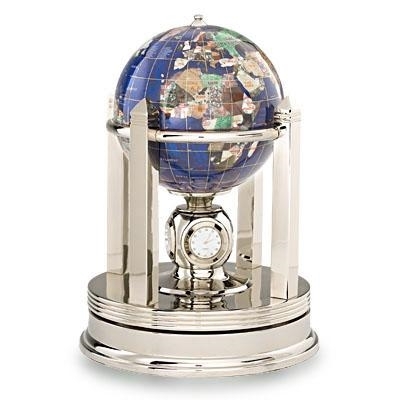 The elegance and sophistication that this globe offers makes it an excellent choice for your home or office. Continents, countries, capitals and landmarks are designated in raised relief. The Lafayette lends a commanding and masterful presence to any interior space that can accommodate its ample stand. 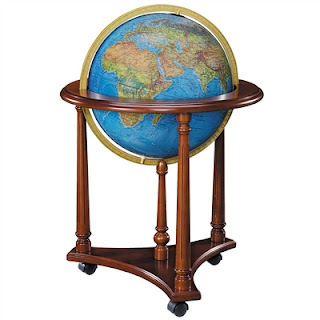 The rich wooden walnut stand adds aesthetic appeal to this globe. There are two styles of the Lafayette available, one model features blue oceans and the other features antique oceans. Both of these models are illuminated by an internal LED and stand 33 inches high when mounted on the stand. Raised relief descriptions of political boundaries make the Lafayette an excellent reference tool for chair side viewing. The Finley features a 20-inch sphere mounted a top a cherry finished wooden stand. 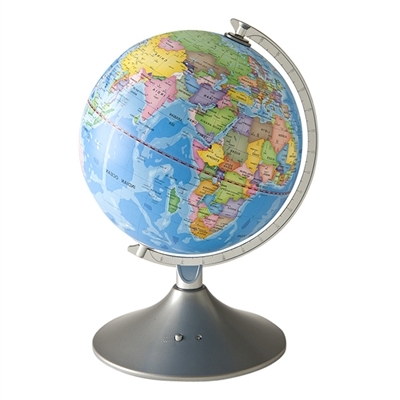 The simple elegance of this globe is enhanced by a full meridian which allows maximum maneuverability. This one of a kind representation of Earth's landscape is a classic and elegant addition to any interior space. The Finley is available in two variations, one model features blue oceans and the other features antique colored oceans. The Viking Expedition includes over 4,000 descriptions of geopolitical boundaries, landmarks, capitals and other points of interest. A full swing meridian with an antique brass compliments the antique oceans of the 16-inch bronze finished sphere. The Viking Expedition combines classic and contemporary craftsmanship to create an elegant centerpiece. The matte finished metal stand features a compass style design as a support for the full meridian. This wonderful globe serves as both a useful reference tool and a classic accent to an elegant interior decor. Opportunities to combine fun and learning are the best choices for Holiday Presents. An understanding of geography is beneficial to children both inside and outside of the classroom. A sense of global awareness and civic responsibility is developed by understanding their relationship to the world around them. Each of these three dimensional representations of the world provides plenty of information about geopolitical boundaries. Each globe has specific features and serves as an excellent reference tool for children complete educational assignments. The Scout II globe is illuminated and measures 12-inches in diameter. A rotating base allows for easy navigation. This spherical representation of Planet Earth is compact and has easy to read descriptions of landmarks. The boundaries of countries and states are presented with relevant details for young students. 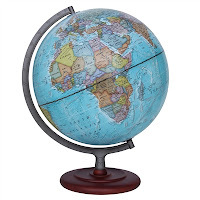 This globe makes an excellent and affordable reference tool for homework assignments. There are over 4,000 landmarks including bodies of water, capital cities, and places of interest. internal LED also provides the option to use this device as a nightlight. This feature is controlled by an inline switch on the electrical cord. This globe/nightlight would find a nice new home on your child's desk or nightstand. This one of a kind globe is an interactive and educational toy that your little ones will enjoy for several years to come. Adults and children can learn together by exploring trivia questions and games. 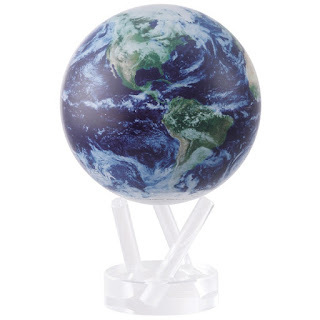 This table top globe is a modern educational tool that combines the fun and adventure of a video game with the useful information of geography trivia. The Intelliglobe II comes with over 2.5 hours of material and connectivity to a special app via iOS or Android allows new information to be downloaded to the Intellipen. The Intellipen is rechargeable using the accompanying USB cable. This device can be used to explore various categories of information at the base of the globe on the feature panel. The accompanying World Discovery Book is a useful reference guide that provides information regarding various aspects of countries around the globe. The Smart Infinity Globe is a toy that provides hours of fun and learning. Connectivity to iOS and Android apps offers the opportunity to access additional information and new content. This device provides over 2.5 hours of educational content. A special device called a Smart Pen provides a built in speaker and a means to record audio notes and find places on the globe. A game like this makes a wonderful accompaniment for road trips and other types of travel. A local map is included as a supplement for geography lessons. A USB cable allows connection to a PC for updates and additional lessons. The Treasury is a unique globe that provides two options for display. Unlike most globes that are designed with either a desktop or floor setting in mind this globe is suitable for both locations. 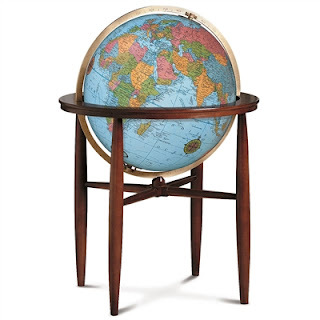 This globe is convertible it can be used as a full 32 inch tall model resting a top its stand. Another option to display this sphere is to disassemble it and place it on a desktop or coffee table. The solid metal base and full swing meridian add another dimension of aesthetic enjoyment. Vivid colors make the cartography particularly appealing to children. The color scheme of the Treasury is a welcome complement to any interior setting. This quality piece offers both reference and aesthetic value. As you are considering holiday presents for the special child in your life, be it your own or a niece, nephew or grandchild consider the benefits of educational gifts such as these globes. Video games, and other sources of amusement will easily be forgotten but one of these awesome globes will be part of your little one's educational journey for years to come. Visit our site to place your order and be ready for Christmas early! 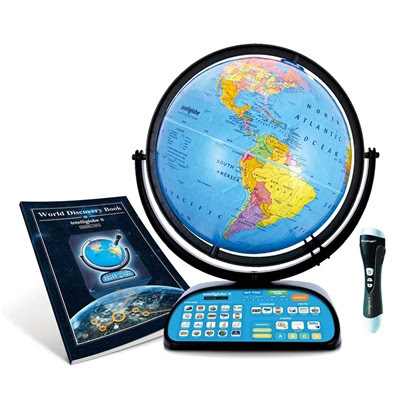 The Newly Updated 2017 Intelliglobe II makes a wonderful Christmas present for elementary students. This educational globe offers hours of educational entertainment. Various player modes provide adults and children with the opportunity to explore the geography of Planet Earth together. The unique design of the Intelliglobe II makes it more like a video game than a social studies reference material. It provides the knowledge that guardians know is important combined with the fun and adventure that kids love. This is a enjoyable way of presenting geography which is a crucial part of understanding the world around us. The Holiday Season is approaching quickly along with the hustle and bustle of searching for gifts. An educational toy is one of best gifts you can give a child for Christmas. Unlike other toys, a gift like an interactive globe is one that will keep your little one profitably occupied for years to come. The three-dimensional representation of the world provided by a globe is a great reference tool. Children can acquire a better understanding of the world around them and enjoy a toy that will continue to challenge them for years to come. 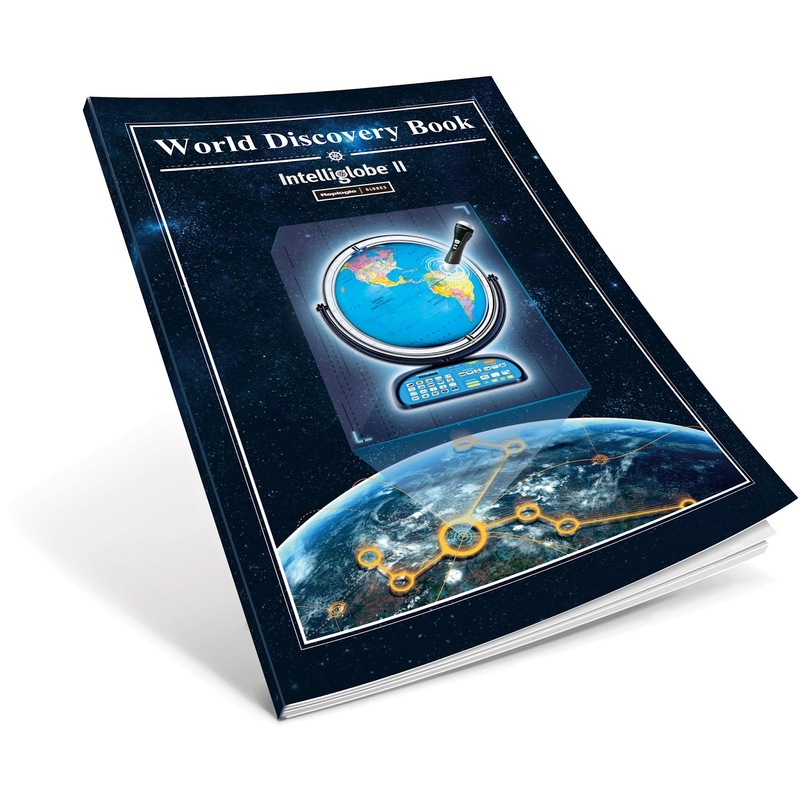 The Intelliglobe II includes a wireless device called the “Intellipen and the World Discovery Book, a reference guide. 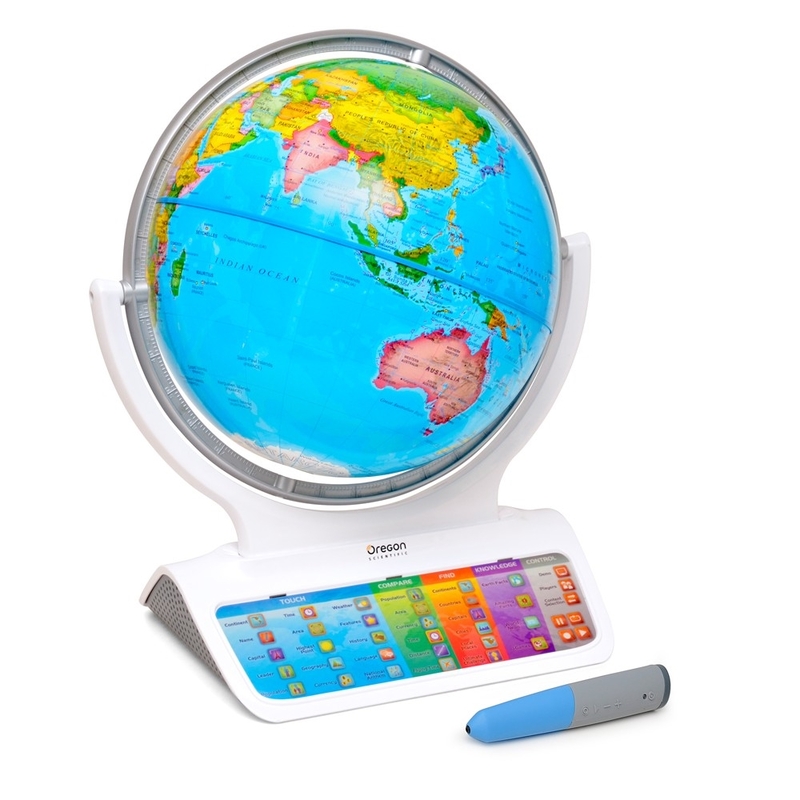 The Intellipen allows children to navigate the globe and learn new facts about geography. Applying the tip of the pen to the categories on the feature panel gives kids the opportunity to learn the language, history, currency, ecology, population and history of each country. This enables kids to have a better picture of what life is like for different people around the world. Educational toys like this one help to reinforce the knowledge being acquired from social studies classes and serve to encourage global consciousness. The Intellipen can be charged via USB cable, this same connection can also be used to download new activities to the device. The World Discovery Book provides plenty of trivia regarding the flags of various countries including the United States. Information is also included regarding the Solar System, Constellations, Bodies of Water, Time Zones, Animals, and Various Peaks of Elevation. If you are in search of the perfect Christmas present for an elementary student look no further for a toy that will provide information and enjoyment for the whole family. Preorder today to receive this limited Holiday Edition item, Place your order now to make sure you get it in time for Christmas Eve. As the leaves begin to drop and Thanksgiving begins to approach it is so nice to enjoy the comfort and company of family and friends. Evenings of entertainment require the appropriate interior decor. Maps and globes make a classic and sophisticated addition to the typical decorations of the fall season. Pumpkins, cornucopia, squash and corn are plentiful this time of year. These earthy decorations have their place in your home, however nothing can match the commanding presence of a globe. The class and sophistication exuded by old school furnishings is unrivaled. Nothing communicates elegant interior design like the presence of a map or globe in your living room or dining room. A classic desktop globe like this one from the Atmosphere collection would be a welcome addition to a mantle or coffee table. The rich color is indicative of autumn leaves, a great way to bring the colors of fall into your living space. The Atmosphere Reflective Sphere Almond Globe makes a great conversation piece, perfect for stimulating discussion about holiday travel plans and vacations. For larger spaces like entryways, courtyards or porches one of our Floor Globes would be an excellent choice. The Viking Expedition is a fantastic combination of modern and classic architecture. 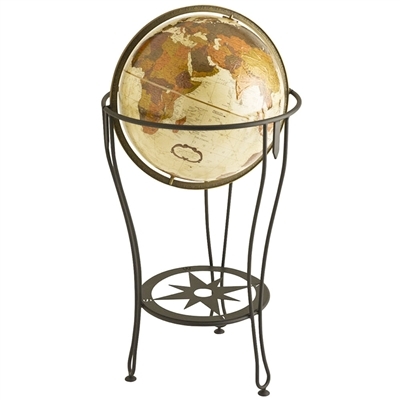 The stand features a compass style design fashioned out of charcoal colored metal, the 16 inch sphere is encased in metal and features a full swing meridian. The sphere can rotate in any direction. The meridian is fashioned from antique brass which compliments the antique oceans of the sphere. There are over 4,000 landmarks and geopolitical boundaries with descriptions on the globe. The Viking Expedition offers aesthetic appeal as well as reference value, all information is reflective of current events. Like adventurers and explorers of yesteryear this globe can be used to plan exciting travels across the world. Atmosphere Globes- New Product Offerings from Ultimate Globes ! Ultimate Globes is proud to announce the addition of a new line of products to our offerings. The Atmosphere line of globes is an extensive collection of designer globes. These aesthetically pleasing pieces are functional as decorative items, educational tools and geographic references. These modern globes are manufactured in various sizes, colors and materials and provide a proportional perspective of the continents, islands, oceans and lakes of Planet Earth. Manufacturing of the Atmosphere globes began in 1949 as a collaboration between father and son Riccardo and Renato Donati. 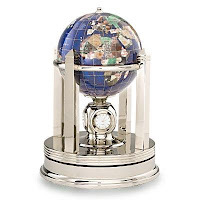 These one of a kind globes are in a class by themselves and represent the cooperative endeavors of several designers and engineers. A mid-size globe such as the Royal Red Cameo Silhouette is perfect for easy reference on your desk or tabletop, in your choice of black or red, this elegant globe is truly one of a kind. A diagonal stand and contrasting colors make this original piece a focal point and a definite conversation piece. A large globe like the “Penthouse Steel model offers enhancement to any traditional office or library setting. The impressive size, and elegant yet grand presence elevates everyday spaces. These are just a few of the exciting options from this new collection. A globe is not just a representation of Planet Earth, it is a way to record changes in geography, ocean topography and political boundaries. In the past twenty years there are countries on each of the continents that have seen changes to their names, boundaries, capitals and landmarks. A globe is wonderful way to stay informed in regards to current events. Few items convey the sense of adventure, travel and mystery expressed by a globe. A quick glance at this sphere can be a great launch pad for travel plans. The Atmosphere globes offer sophistication and an artistic representation of the Earth to adorn your mantle, office desk or bookshelf. Stay tuned for more elegant pieces that can be integrated into interior design. Venus, Mars, Jupiter, Uranus, and Neptune. The solar system has been a subject of both mystery and awe for humanity. We have tried for millennia to understand the complex world beyond our immediate grasp. Ancient stargazers observed the beams of light emanating from the celestial bodies of the night sky and decided to call them “planets”. With advances in technology and the passage of time we have been able to obtain a greater understanding of outer space. Mercury, Venus, Earth and Mars are known as the terrestrial planets because of their solid rocky surfaces. The outer lying planets Jupiter, Saturn, Uranus and Neptune are called gas giants, and diminutive Pluto has a frigid surface. Pick up this set to learn more about the planets and experience hours of intergalactic enjoyment. These inflatable planets are a practical way to demonstrate the rotation, revolution, and orbit of the solar system. The accompanying trivia guide provides a catalyst for discussion of topics like the relative size of the planets, travel in space, and the impact of zero-gravity. In our ever changing society it is highly beneficial for children to understand their place in the global community. An appreciation of other cultures and the ability to connect with those with different lifestyles is crucial to interpersonal development. The advent of globalization has diminished the boundaries between countries and continents. E-commerce has further eliminated the degree of separation between nations. A few clicks of a mouse and keys on a keyboard and you can purchase items from anywhere in the world. One of the best ways for children to get a perspective on the world around them is to play with a globe. Globes provide so much information about the world around us. One of the most important things that can be learned from looking at a globe is that the world is round. This concept is not well conveyed by a regular flat map. Making a connection between places learned about in history and a spot on the globe makes the information more relevant. An understanding of geography is also useful for learning about weather patterns and climate. A simple glance at the globe and knowing the seasons being experienced by different countries provides relevance to media reports. The evening news makes so much more sense when you can see where that cyclone or monsoon happen. This also allows you to learn about and comprehend the patterns of climate change that are common to certain areas. Understanding geopolitical boundaries is another reason to have a globe. There’s no better way to get a grasp of where places are then to take a finger and point to them. Learn the capitals of states and countries, learn the continents. Learn about different people and cultures broaden your horizons. Spin the globe and pick a new place for your class to learn about. Explore the globe with your students. Globes have been around for centuries, and this causes some people to think that they must be obsolete by now. In reality, they're just as important as they ever were, and mostly for the same reasons. Globes are meaningful today because they provide a fully 3-D view of the planet in a tangible and easily understood way. Depending on the specific globe, they may also provide 3-D topographical information, data on trade routes, and other extras. In today's world, it's common to see news reports about countries that weren't even in the general consciousness a few years ago. Sometimes, the United States even ends up having military involvement in these places. Many people end up wondering just where these places are, but the news often is no help when it comes to this part. If the programs bother to show a map, it'll be a close crop that doesn't let viewers visualize where the area is in relation to known areas. Using a globe makes it easy to see exactly where everything is. It can take a while to find a country on a globe the first time, especially when news reports only give vague descriptions like "in the Middle East" or "in Africa," but once the location has been pinpointed, it is unlikely to be forgotten. This is because you'll be able to see where it is in relation to places you already know about. Once you see it on the globe, you'll also be able to understand what the reports about when they speak of difficulties related to airbase placement, shipping lanes, and other important factors involving the nearby countries and geographical features. Globes show geographic features like mountains and rivers. The best of them will even render the altitudes of these features in 3D, which makes it even easier to tell their relative heights and depths. This makes it easy to see important mountain ranges like the Rockies, see the path of the Nile River, and spot other important features. Having this knowledge makes it easy to understand how certain geographical elements have altered exploration and settlement patterns, guided the growth of nations, and more. It's also easier to predict the climate of a new location by spotting it on a globe. Climate is roughly predictable by how far from the equator a place is. Its proximity to an ocean is another factor that plays a big part. This makes it so that you can take a look at a globe and tell right away whether the area will have a winter, whether it's likely to get a lot of snow or have a dry season instead, and whether it's likely to be in the way of hurricanes or cyclones. This information is important for planning moves or vacations. Even adults have plenty of trouble visualizing where things are when they can't see 3D images of them on a globe. This is even worse for children because they have a limited base of already-known locations. Pointing everything out on the globe will make it easy for kids to learn and grown-ups to refresh their memories. There are even kid-friendly globes that are designed to make this easier. These are just some of the reason globes are still meaningful despite their ancient origin. They're also very decorative, and some styles add much sophistication to a room. This makes them some of the most useful accents a home can have. To learn more about our globes or get help choosing the best one for your needs, just contact us. We'll be glad to suggest the perfect ones for your needs. At its finest, interior decor -- whether in your home, office, conference room, or event space -- should reflect your aesthetics and you values. The way a space is decorated creates a subtle communication to all who walk in the room. The way a room looks impacts the way you and your visitors feel. Is the space uplifting? Is it simple, sleek and modern; or full of ornate and regal trimmings? There are infinite ways to add beauty and style to a room. Many interior designers make use of globes as an upscale decoration; one that also functions as a conversation piece, a learning tool, and a source of wonder and curiosity. Gemstone Globes create a special statement in any space. These beautiful globes are outfitted with real semi-precious gemstones, like lapis lazuli, mother of pearl, abalone shell, amethyst, and turquoise. Most globes depict a blue ocean. Some of our gemstone globes are made with deep blue turquoise oceans, while others show the sea in purple, teal, grey, or green. Color is the outstanding feature of these lovely objets d'art. Gold leaf longitude and latitude lines create the perfect accent for the rich colors on many. Gemstone globes integrate the intellectual interest of a world globe with the stunning beauty of fine jewelry, or a work of fine art. They add dazzling color to your space, and create a stunning visual statement in any room. These gemstone globes create a statement of polished beauty and high-class, whether in your library, living room, or office. Sometimes a smaller globe is more suited to your space. Desktop gemstone globes are smaller and made to rest on surfaces. They are ideal for accentuating bookshelves, display tables, and work surfaces. Along a bookshelf, they create a posh, intellectual look. On a desktop, they provide a bit of beauty and wonder to glance at while you work. As a diversion during projects, gemstone globes provide a welcome shift in perspective -- allowing you to "zoom out" from your intense focus and remember the vastness of the world. Gemstone globe book-ends can add a unique touch to your bookshelves or library. 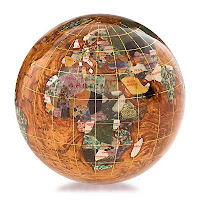 Even smaller than desktop globes are our gemstone globe paperweights. These little sculptures, of course, function well to hold your papers in place! But more than that, they create visual surprise and interest where it might not be expected. Picture these small globes interspersed here and there among the books on your shelves; on your coffee table; or displayed in your kitchen. We've even seen these little 'gems' suspended from the ceiling, to create a whimsical and elegant impact. Wherever you place them, these mini gemstone globes remind viewers of the splendor and wonder of our world. They also make fantastic gifts! Whether you are seeking to redecorate your home, add a little spice to your workplace decor, add visual interest to your conference room, or give a thoughtful gift, consider decorating with gemstone globes. Do you have questions or comments about gemstone globes, or any of our other high-end globes? Contact us. Contrary to popular belief, the people of antiquity never believed that the world was actually flat. In fact, the concept of a spherical Earth goes all the way back to 3rd century Greece. During that time, celestial globes were extremely popular. It wasn't until the 11th century that Islamic astronomers constructed the first terrestrial globes. Although the features of a globe have evolved over the centuries, its purpose and value as an educational tool remains as important as ever. German geographer Martin Behaim created the oldest surviving terrestrial globe in 1492. Unlike today's, this earlier example documented not only locations, but also recorded market places and local trading protocols. In the 1500s, Flemish geographer Gerhard Kremer developed the Meractor projection map. The Meractor projection map included all of the meridian and longitudinal lines parallel to the latitude lines. This feature made map reading simple for navigators and is still used today. In the 17th century, globes were not only functional but fashionable. English gentlemen wore pocket globes as status symbols and elaborate globes were kept in homes and gardens as decorative furniture. The 19th century saw a boom of affordable globes made from paper and other inexpensive material. Once used in training navigators and astronomers, they gained popularity with primary schools and tutors. The added time dial feature taught students to compare time from around the world. Today, globes come in all sizes and varieties. Political globes display not only physical characteristics but also political boundaries. When turned on, illuminated globes often display additional information like topographical points. Despite online world maps and virtual Earths, nothing can compare to the tangible feeling of a globe. To learn more about our globes, contact us and we'll be more than happy to help.